Bauman Ville is located near the tropical jungle-covered hills in famous resort town of Patong Beach on Phuket Island. Nearby are many great international restaurants bars and boutique shops. The beach nighttime entertainment and the large Jungceylon shopping mall are only minutes away.Bauman Ville is a stylish and affordable boutique hotel central to exploring Patong Beach and Phuket Island. The hotel is located in the heart of the business area. 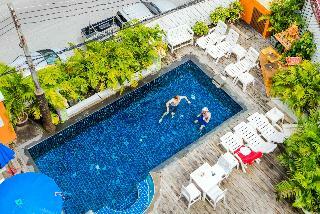 It provides easy access to many banks and shopping centres, as well as Phuket's Old Town. Patong Beach and Andaman Beach are both some 45 minutes away by car. Phuket International Airport is approximately 45 km away from the establishment.This contemporary, boutique-style hotel features 68 accommodations units. These well-designed serviced apartments are furnished with modern amenities. Facilities available to guests at this establishment include a reception area, lift access to the upper floors and a restaurant. Business guests will be able to take advantage of wireless Internet access.Standard in-room amenities include a private bathroom, satellite/cable TV and Internet access, as well as a kitchenette and minibar. A double bed and individually regulated air conditioning units are also included.Guests can enjoy a massage or work out in the gym. There is a pool table available for leisure. 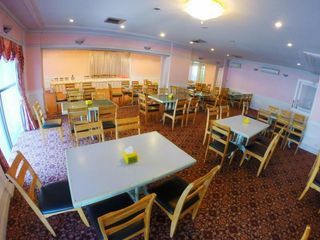 Moreover, the hotel offers a supermarket and clothes shop and tour desk for visitors.There is a supermarket on-site provided for guests.When coming from the airport, guests should take the highway 402 to Phuket town until they pass Heroines Monument. Then they should continue driving to Rasada Road. After seeing the Ayuttaya Bank at the corner they should keep driving along the way to the hotel. This 5 star hotel is located on the coastline of Phuket Island and was established in 2016. The Hotel has an outdoor swimming pool. Blu Monkey is lifestyle Boutique Hostel arising from the aspirations of the group which want to create good accommodation in Phuket for tourists both Thai and foreign in the budget of everyone.“Blu Monkey” The name was inspired from when I was a kid everyone always has a toy to play it. Often carry with it when sleeping. We hope that the Blu Monkey is a friend beside you you can sleep well when staying with us.The Blu Monkey Hostel not Hotel has established itself as we have no restaurant no meeting rooms and no pool. Since we found that most of the hotel rooms in the city will not take these things so that when the customer is using customer should not have to pay in this section. That is a major reason that the price of the Blu Monkey Room with Stylish comfortable and situated in a convenient location is in everyone's budget. 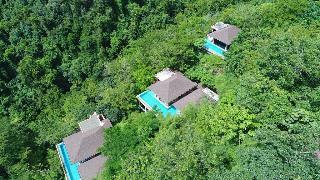 Surrounded by the beautiful mountains of Phuket Korsiri offers peaceful villas with a private pool and free Wi-Fi. A free shuttle goes to Panwa Beach and the Phuket Aquarium. Personal sun lounge chairs and an outdoor dining area are available by the private pool. The in-villa kitchenette comes with a microwave and electric teakettle. This property is 15 minutes walk from the beach. Baan Kongdee Sunset Resort is a 5-minute drive to Kata Beach and 20-minute ride to Patong Beach. It features a swimming pool and free Wi-Fi.A 20-minute drive to Phuket Town, Baan Kongdee Sunset Resort is a 45-minute ride from Phuket International Airport.Air-conditioned rooms offers a flat-screen cable TV, fridge, safe, minibar and electric kettle. Shower facilities are provided in an en suite bathroom. Guests can enjoy stunning views on a private balcony.Hotel facilities include free public parking and laundry services. 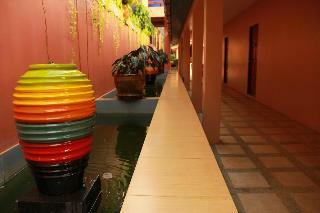 Guests can go for a stroll in the garden. Trips to various attractions can be arranged at the tour desk.International dishes and local favourites can be sampled at nearby restaurants, which are just a 5-minute walk away. This stylish property is the best option when visiting the stunning city of Phuket, as it features both a prime situation and a unique service based on attention to detail. It is just a few steps from the city centre, where guests will find a host of restaurants and entertainment options, and provides easy access for guests to explore all this stunning area has to offer, such as the Phuket Philatelic Museum, the Hei Leng Ong Statue or the beautiful Wat Mongkol Nimit Temple. 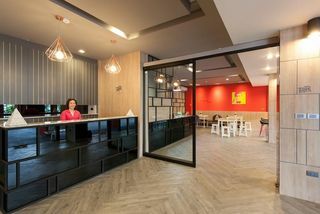 Travellers will appreciate the range of unrivalled services and amenities on offer at this urban hotel. All guest accommodations feature thoughtful amenities to ensure an unparalleled sense of comfort, such as air conditioning and complimentary coffee and Wi-Fi. Besides, the hotel serves a free breakfast ideal to kick start the day. Gotum Hostel & Restaurant 2 is located 100 m from Old Phuket Town, 300 m from Thai Hua Museum and 601 m from Chinpracha House. This accommodations features a restaurant, a bar and free WFi.All private rooms at Hostel Gotum comes with air conditioning, a flat-screen satellite TV and a seating area. Private bathroom is available in the private rooms. 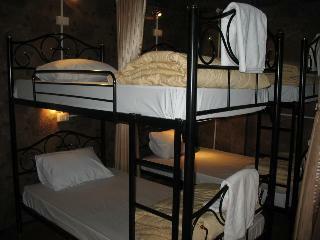 Guests of dormitory room have access to a shared bathroom. A safety deposit box and a desk are standard in all units.Additional convenience of the guests at Gotum Hostel include luggage storage and currency exchange. Staff at the on-site tour desk can help arrange trips and ticketing. Free parking space is provided.Within a short drives, guests can find Orchid Garden and Thai Village (1.7 mi), Butterfly Garden and Insect World(2.2 mi) and Khaokhad View Tower 3.4 mi). Phuket International Airport is under 16 mi away. The Phuket Town Inn Hotel is Located in Phuket Town, 300 m from Old Phuket Town, Phuket Town Inn features free WiFi access and free private parking. Guests can enjoy the on-site bar.Rooms are fitted with a TV. Certain rooms feature a seating area for your convenience. Some rooms include views of the sea or city. Each room is fitted with a private bathroom fitted with a bath.You will find a 24-hour front desk and shops at the property.Thai Hua Museum is 500 m from Phuket Town Inn, while Chinpracha House is 700 m away. The nearest airport is Phuket International Airport, 26 km from the property. The hotel is located in the heart of Phuket old town, providing an easy access to the main road.It is a stylish apartment hotel, designed in Sino-Portuguese influences, accentuated with antiques adorning the hotel reception foyer. It features 57 rooms, that are exquisitely designed and replete with vital amenities.The property compromises of 18 Deluxe Beijing, 27 Deluxe Shanghai and 12 Sino Suites. 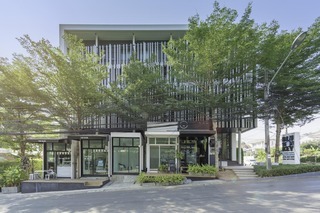 Rooms are equipped with free minibars, free local calls and free Internet access.The hotel provides 50% discount at The Raintree Spa programs.Continental buffet breakfast is served at the hotel.The hotel is reachable within a 30 minutes drive from Phuket International Airport, 15 minutes from Rassada Pier and 10 minutes from Phuket city center. Big Room, Clean, and freindly staff.